﻿ Cristiano Ronaldo season review: The perfect year! 22.07.2016 » Cristiano Ronaldo 2015-16 season review: The perfect year! In many ways on an individual level this may be the worst season Cristiano Ronaldo has had since he moved to Real Madrid. But in many other ways it could actually be the most important season of his career. This season will go down as the redemption season for the Portuguese superstar. While not his best individually we saw him develop both as a man and as a leader. 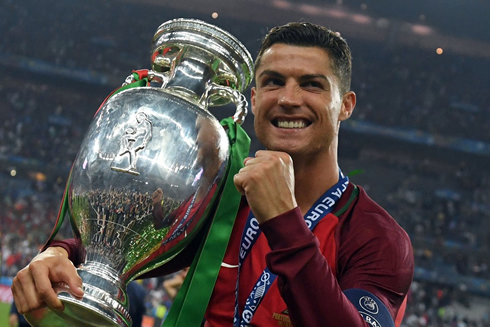 Let's rewind the tape to the beginning of the season and go through every capital moment that led to this spectacular ending where Ronaldo got to lift both the UEFA Champions League for Real Madrid and the European Championship Cup for Portugal. Ronaldo started off the season in poor form, by his standards. It was apparent even from the pre-season that something was just a little bit off. In fact, it likely stems back to the entirety of 2015. Even when he scored, Ronaldo never quite looked himself. Sure, he scored 5 vs Espanyol, but apart from that outburst, he struggled to find the back of the net more often than we've all been used to. In fact, it was a shock for many Cristiano Ronaldo fans who have grown accustomed to seeing him excel at all times. Then came the criticism "Ronaldo is past it," "he's declining," and even "Ronaldo only scores against small teams." Ronaldo's comment about his teammates' fitness didn't seem to help either. And the media criticized him as well. Then Madrid lost 0-4 to Barcelona in El Clasico. And all hope felt lost. Admittedly, it appears as though much of this may have stemmed from the manager's tactics. Rafa Benitez, never a popular choice for Madridistas anyway, seemed to have lost the ability to motivate his team and it was time for Madrid to make a new appointment. Not only were Madrid as a unit a better team, Ronaldo himself started to perform better, far better and he looked happier on the pitch. 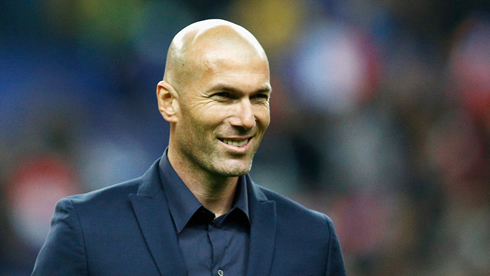 Zidane wanted everyone to defend and Ronaldo obliged. Suddenly, the team was firing on all cylinders and they couldn't be stopped. Ronaldo himself would come into form as well. Goals against Roma, Athletic Bilbao and of course his match winner vs Barcelona silenced the haters who spoke about his inability to shine in big games. And if goals in those games merely silenced the haters, his hattrick in the second leg against Wolfsburg, a game in which Real Madrid needed to come back from a 0-2 deficit, effectively shut them all up. It was a legacy game for Ronaldo, one that will be remembered forever. His injury against Villarreal would dampen the rest of his season but he still saw glory scoring the final penalty against Atletico Madrid in the UEFA Champions League final. 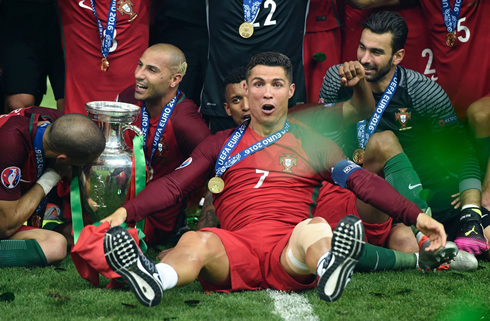 The Portuguese National Team were not remotely tournament favorites heading into the EURO 2016. Though they have been sweeping up all the youth team titles in recent years, this tournament felt it like was badly timed considering the makeup of the squad. For some, it was too late: Ricardo Carvalho. For others, it seemed to be too soon: Renato Sanches (though Sanches proved those doubts wrong almost immediately). 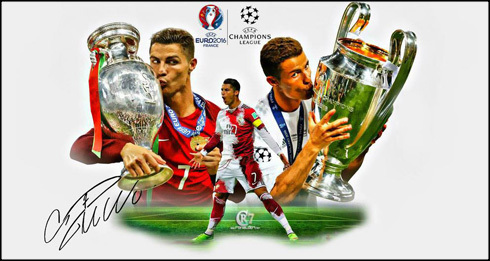 Still, captain Ronaldo was confident and Portugal entered the tournament hoping to make their country proud. And they failed to do so in the first couple of games. Their 1-1 draw with Iceland brought on disappointment and criticism for Ronaldo in particular. He missed quite a few chances and his post-match comments about Iceland's "small team mentality" didn't make him any new friends. But it would be the third game, the one where Portugal needed him the most, when Ronaldo would step up. An audacious backheel and a trademark header would be enough to help Portugal earn a 3-3 draw and qualify for the knockout stages despite not winning a single game in the group stages. Facing off with tournament dark horses Croatia, few favored Portugal. But they endured and scored a late winner after Ronaldo's close range shot was saved and Quaresma was able to bundle home the rebound from close range. 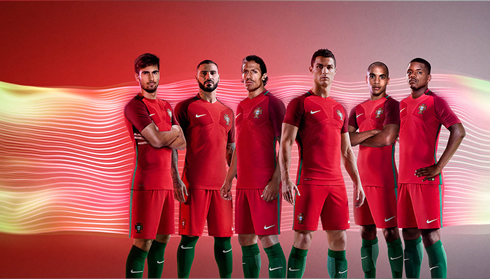 A few days later and against Poland, Portugal found themselves again under duress. An early goal from Robert Lewandowski put Poland in front early. The wonderkid Sanches would level it before halftime. The game would be another defensive showcase with Pepe having a brilliant match, but eventually it would come down to the dreaded penalty shootout. And Ronaldo would step up first. Four years ago, Ronaldo never got to take the final penalty against Spain. "Injustiça" he whispered to the heavens, as Spain's last penalty hit the back of the net. This time he would go first, leading by example, putting the penalty miss earlier in the tournament out of his mind. And he'd score. Easily. Portugal were in pole position and they never looked back. As a captain, Ronaldo stood with his players almost unable to look at times he was able to instill confidence in them as well. Eventually, Quaresma would again score the final winning goal and Portugal were through to the tournament's semifinals vs Wales. It's a matchup that would be viewed as Bale vs Ronaldo, but it was far more than that. Wales were the toast of the tournament. Their impressive 3-1 victory over Belgium was perhaps the performance of the tournament and they were flying high on confidence. In many ways this tournament was cyclical for Ronaldo. In 2012, he couldn't take the penalty, in 2004 he lost at home in the final. A victory in the Stade de France over the host nation would be the perfect redemption. But only 8 minutes in and the dream turned into a nightmare. Dimitri Payet's tackle on Ronaldo's standing leg would take him out of the match. Ronaldo tried valiantly to continue, but after coming on and off a few times, it was clear he was in too much pain. After all the years of waiting, Ronaldo would miss perhaps the biggest match of his life. But he wouldn't be phased for long, emerging from the dressing room bandaged up, Ronaldo would take on the role of manager. Motivating and coaching his team, offering guidance when needed as well. Portugal would continue to endure, but no chances seemed to come. Heading into extra time, with both teams exhausted, we looked again to be heading for a shootout when the unlikeliest of heroes Éder, popped up with the game winner. Soon after the final whistle would blow and Cristiano Ronaldo would lift the European Championship. What a ride and what a season. Ronaldo was not at his glittering best this year, but he was decisive when it mattered and he grew both as a leader and as a man. Watching him cheer on his teammates during the final was fantastic and we've seen yet again that CR7 can continue to evolve no matter the circumstance. Cristiano Ronaldo next game with Real Madrid is a pre-season friendly on July 27 of 2016, against PSG. You can watch Juventus live stream, Real Madrid vs PSG, Celtic vs Barcelona, Manchester City vs Manchester United, Celtic vs Leicester City, and SpVgg Landshut vs Bayern Munchen, all matches provided from our football live game pages.